Winner of the 2011 High Times Cannabis Cup, Liberty Haze by Barney’s Farm has a reputation that precedes her. Her heritage gives her a lot to live up to, so we take a look just how well she manages it. Liberty Haze is a strain of cannabis known well to many Haze connoisseurs. She is the mix of a male G13 with a fast flowering ChemDawg 91, both of which are champions and well-celebrated strains in their own right. Through some very rigorous breeding, Liberty Haze has been stabilised into a variety of cannabis that takes all the potential of her parents, and makes it her own. Liberty Haze is a cannabis hybrid that utilises both indica and sativa growing traits. The result is a medium height plant - roughly 1-1.4m indoors – that produces some very elegant and graceful looking long colas. Her genetics also give her a relatively fast flowering time, with her completing after 66 days for us. What it leaves you with is some very magnificent and dense bud, frosted with trichomes. This follows through into massive yields, with a potential for over 600g/m² when grown with skill. 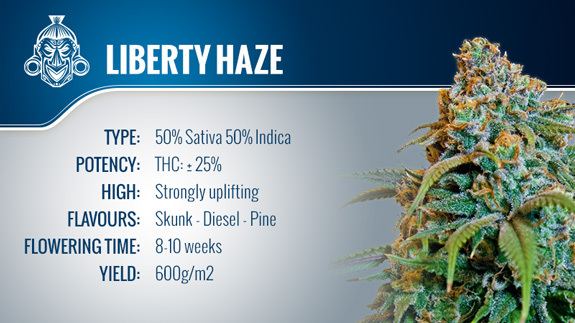 I found Liberty Haze to have a very refreshing flavour, mixing notes of pine and citrus, while riding an overarching skunky tone. It makes her quite a fragrant strain, which should always be taken into consideration when discretion is key. It is easy to see why Liberty Haze was so popular at the 2011 High Times Cannabis Cup; she is certainly top-shelf material. For those who don’t enjoy the sativa high, there is little here for you. However, if you happen to love the sativa experience, but want it with a fast flowering time, you could do no better. Liberty Haze is one of the ultimate members of the Haze family, despite her 50/50 genetics.